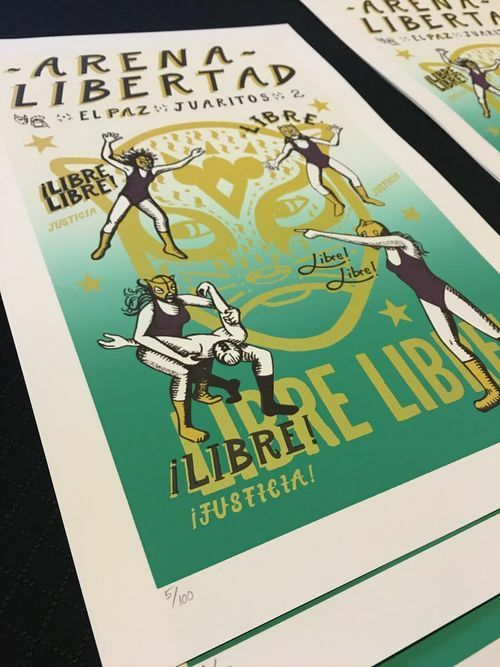 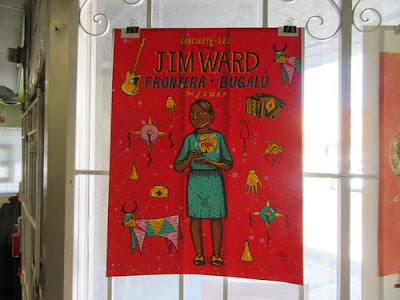 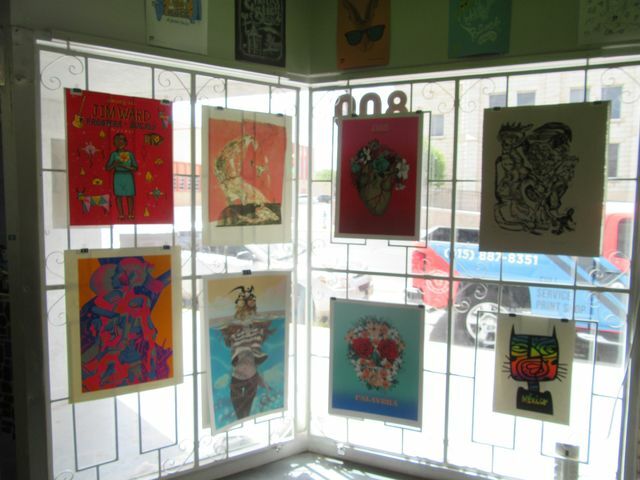 We are showing 30 new prints that essentially were made since our show went up at the El Paso Museum of Art last January. 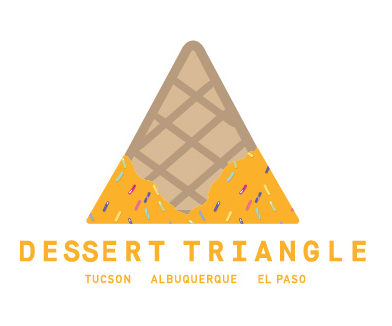 The "Dessert Triangle" opened the night of Thursday, May 19th -- 6 - 9 PM -- at Proper Printshop in El Paso (800 Montana Avenue). 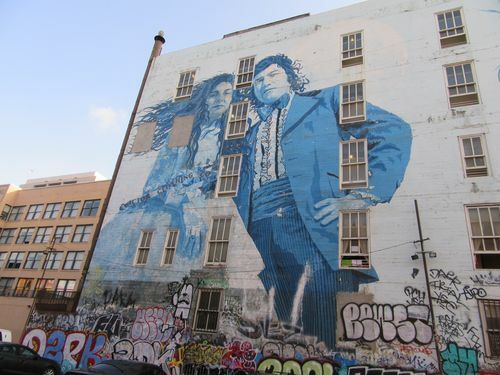 It stayed up for two weeks, coming down on June 3rd. 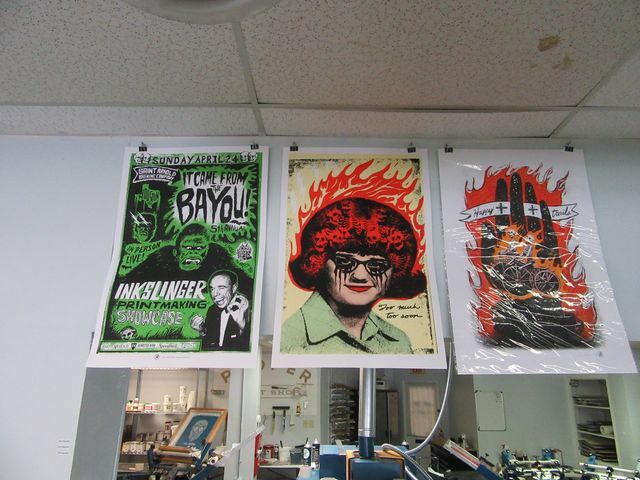 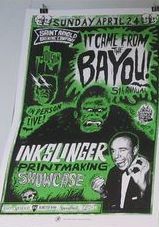 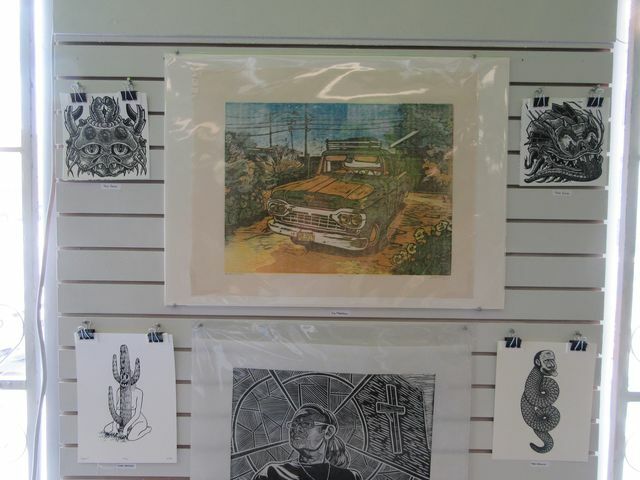 Also we are showing the prints that we bought in Houston last month, at the "It Came from the Bayou" print fair at Saint. 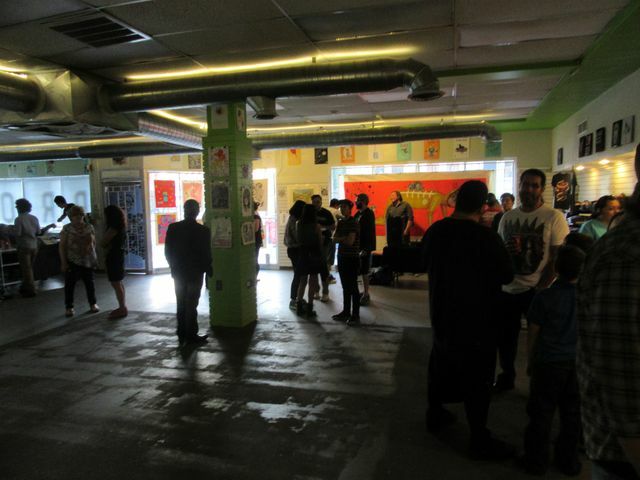 Arnolds' Brewery. 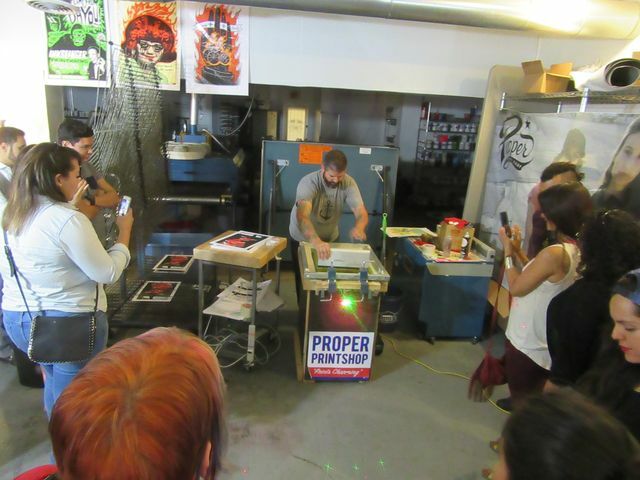 "It Came from the Bayou"
Our pop-up show was side busting on Mitsu Overstreet's live printing during, during "Art in Vivo." 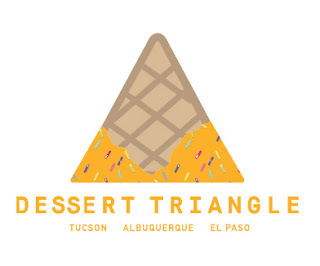 The goal of the "Dessert Triangle" was to collect 30 prints that have been done since our exhibit went up at the El Paso Museum of Art last January. The printmakers did not have to be the same artists that participated in the Desert Triangle Print Carpeta, nor did the prints have to be editions. 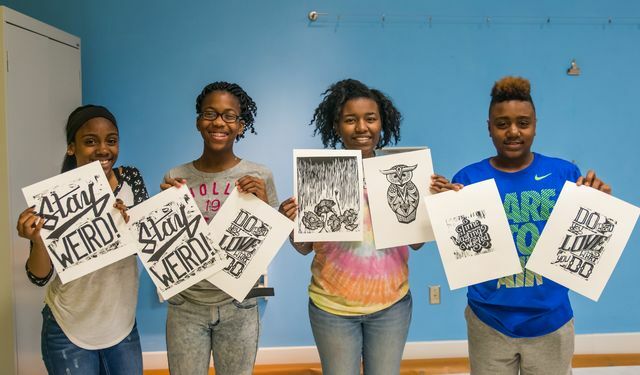 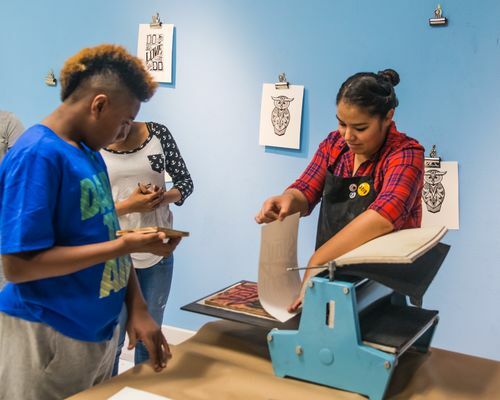 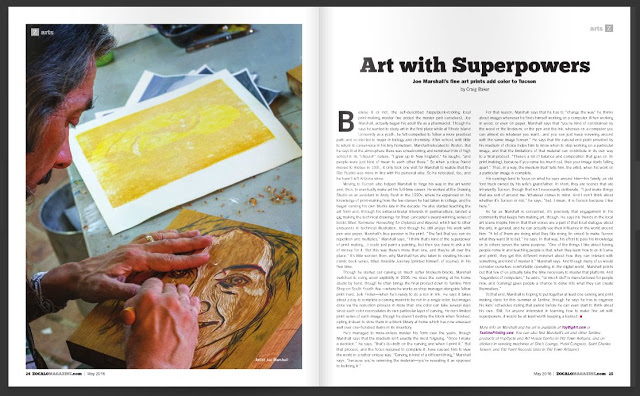 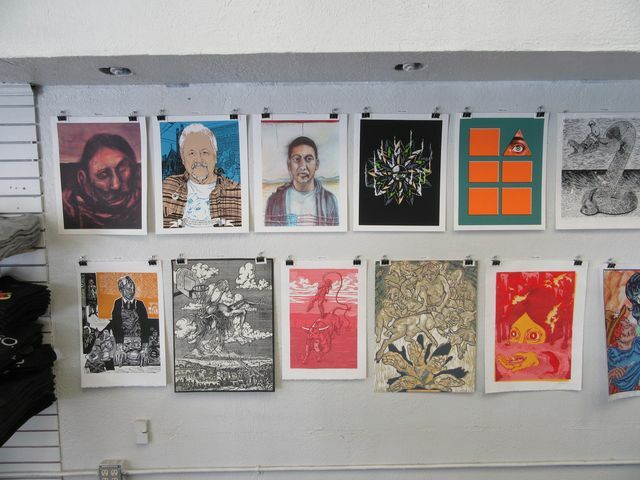 We just wanted to encourage and boost printmaking. 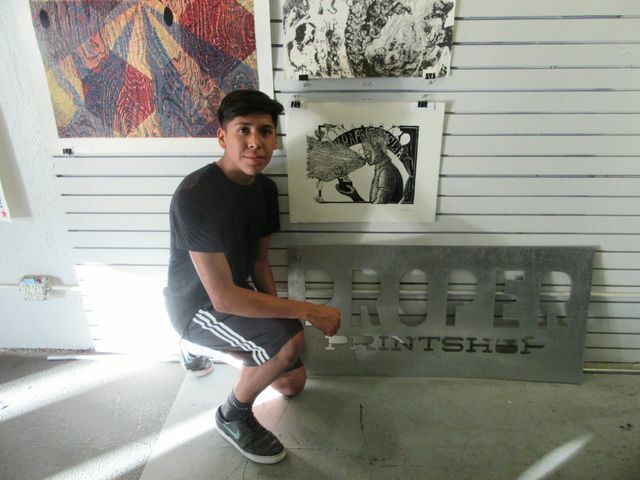 Hopefully our effort was just a beginning, and the best prints are yet to come. 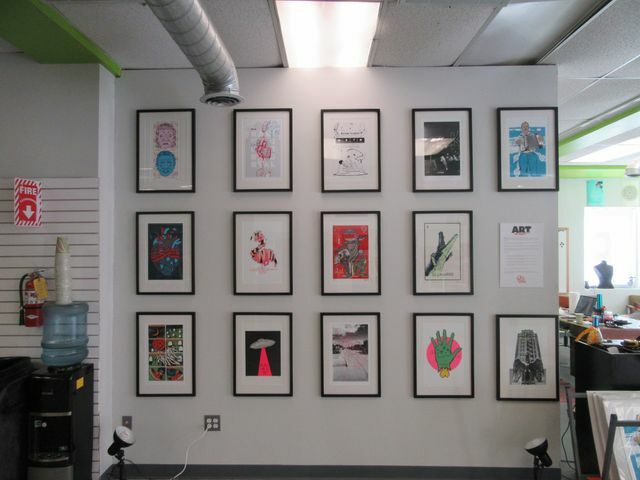 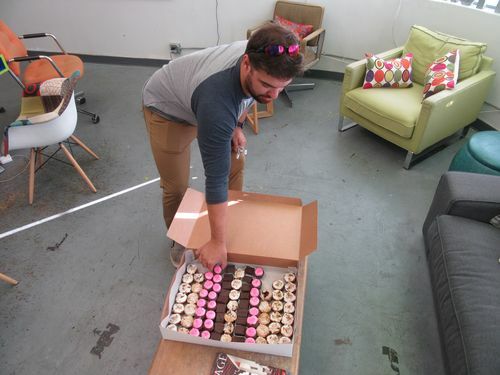 I collected the following 28 prints from 28 artists, and hung them for the Dessert Triangle pop-up show on May 19th. 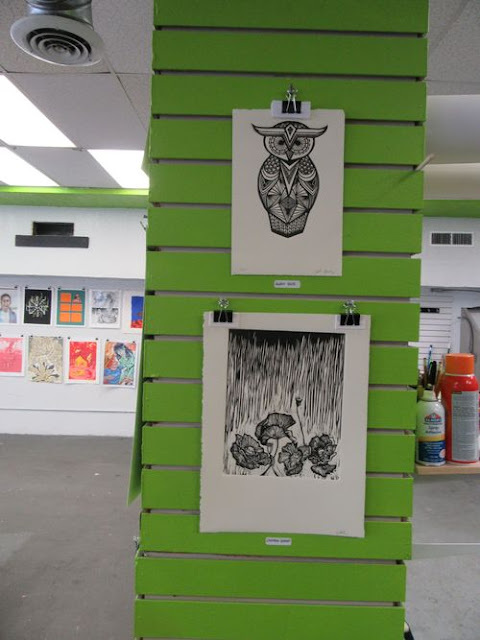 28 + 16 = 44 prints, stretching our goal by 14 prints! There is a great YouTube video online, of Omar Gonzales printing a bigger version of his "Diamondback Cowboy" print (big enough for steam roller printing) using an Iron Frog glass print baren. 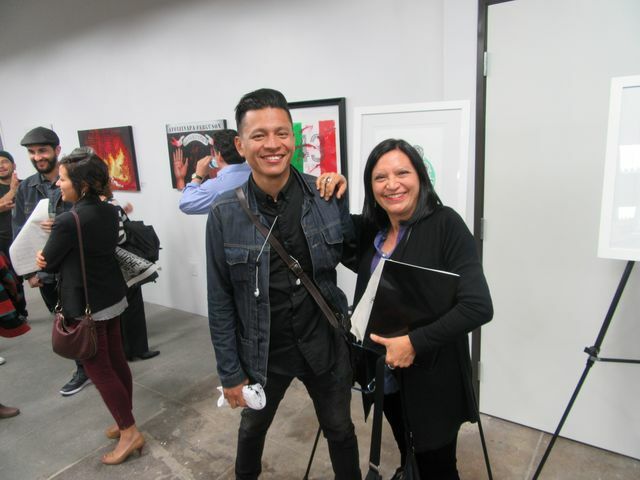 Christin Apodaca also came to see the show. She will be doing a "Art en Vivo" print soon. 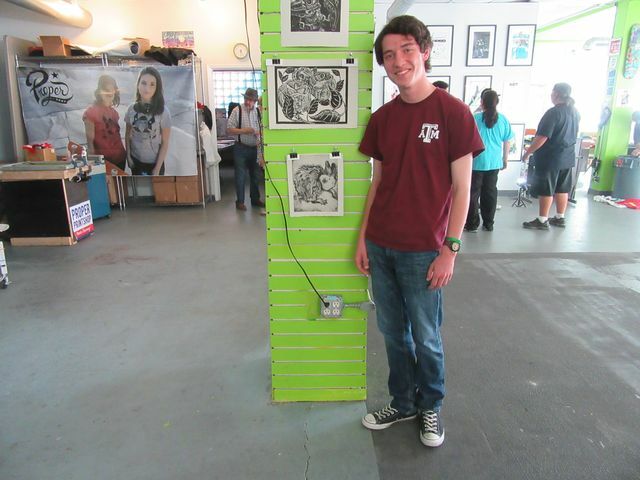 Cameron Scott came to the show. 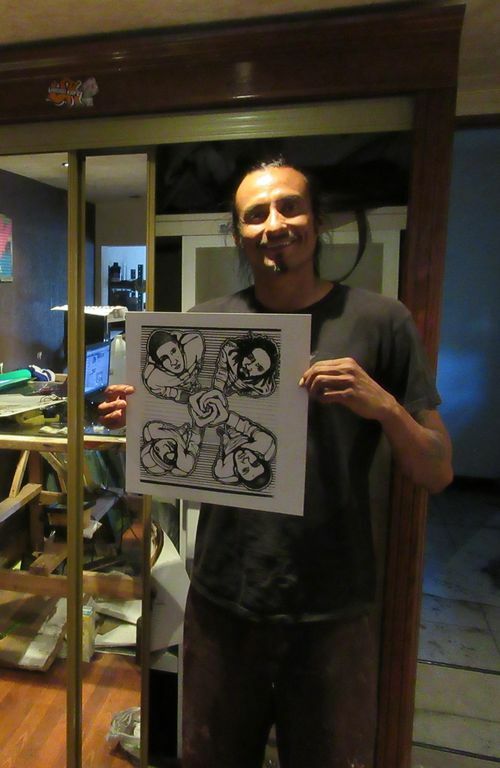 Dave "Grave" Herrera also came. 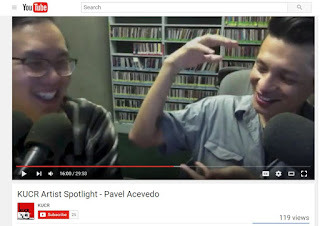 We were on KVIA TV, Saturday morning, May 20th (though our video segment doesn't seem to be archived in the video online). 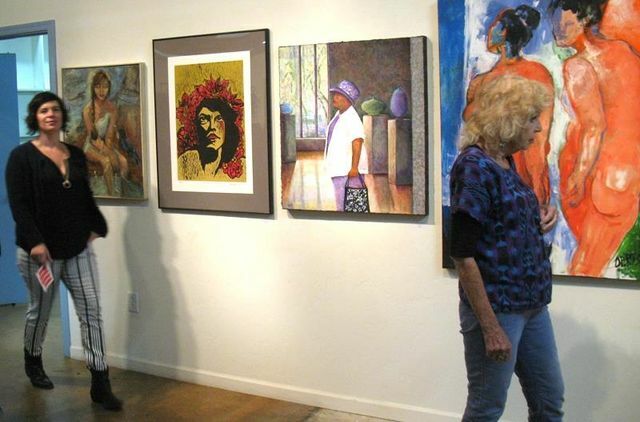 Desert Triangle artists surface in new shows while the exhibit is still up at the El Paso Museum of Art. 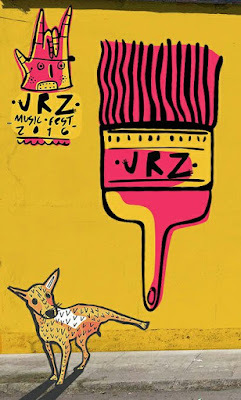 Jellyfish and Los Dos participated in the JRZ jazz festival in Ciudad Juarez. 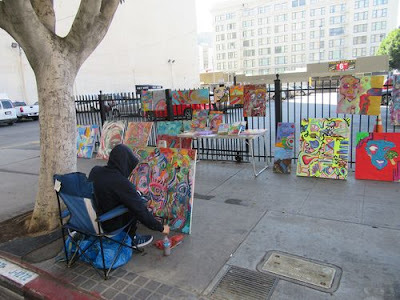 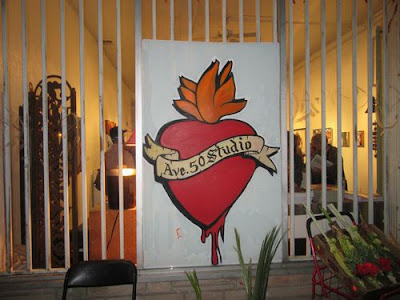 Pavel Acevedo participated in 2 shows in Los Angeles. 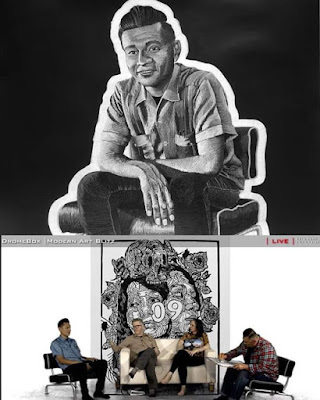 Joe Marshall was featured in a two page spread in the May 2016 issue of Zocalo Magazine. 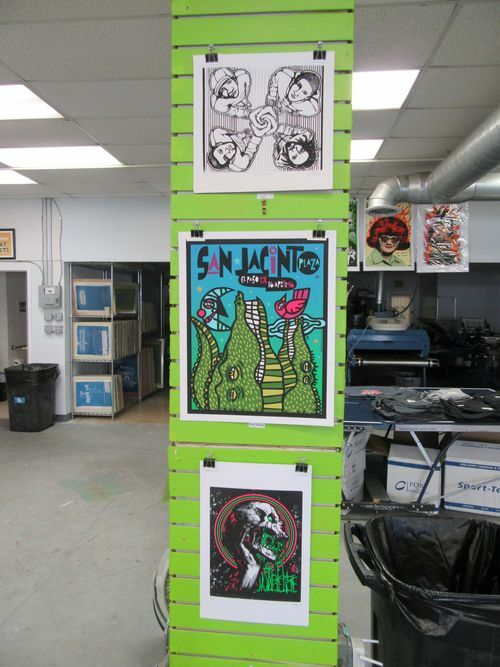 Krrrl's print collaboration with Skinpop of Mexico City was printed by Taller 75 Grados. 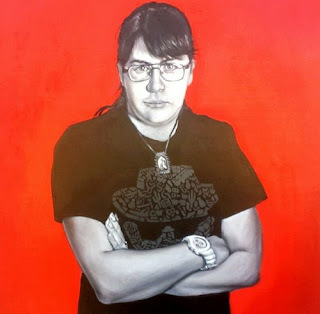 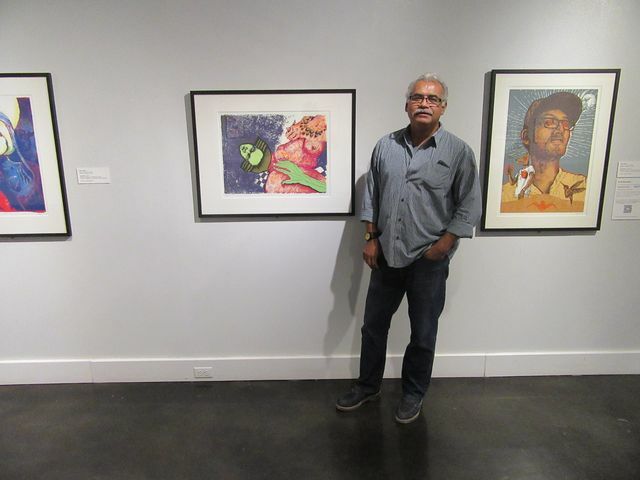 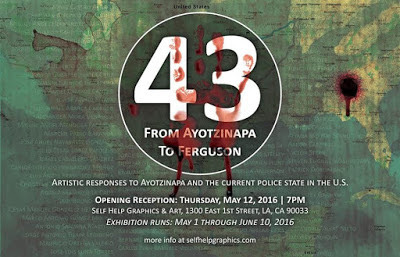 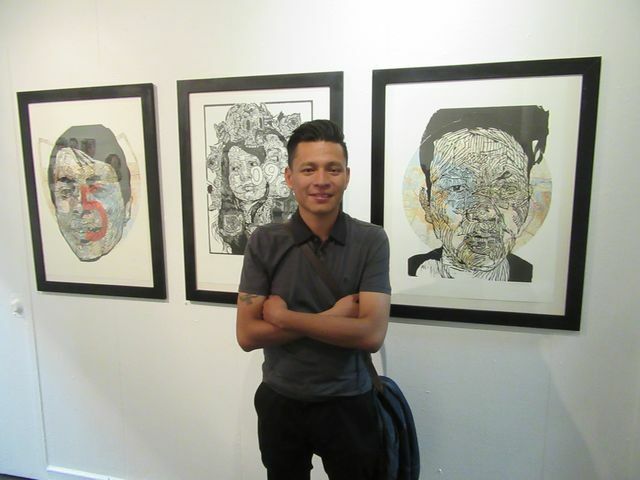 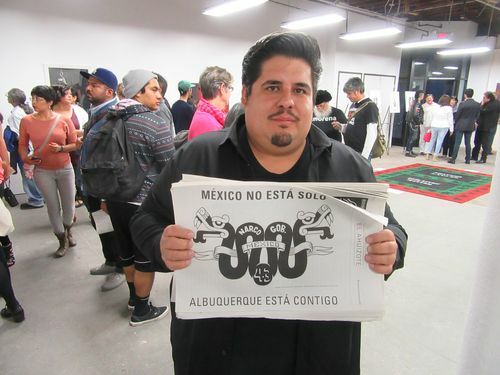 Zeke Pena participated in an exhibition at the National Hispanic Cultural Center in Albuquerque. 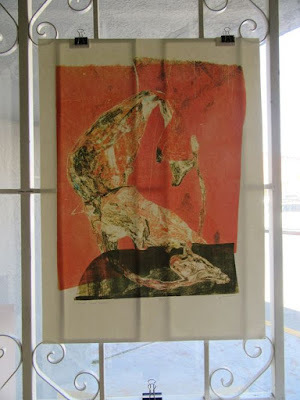 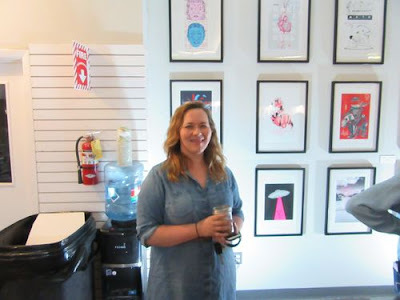 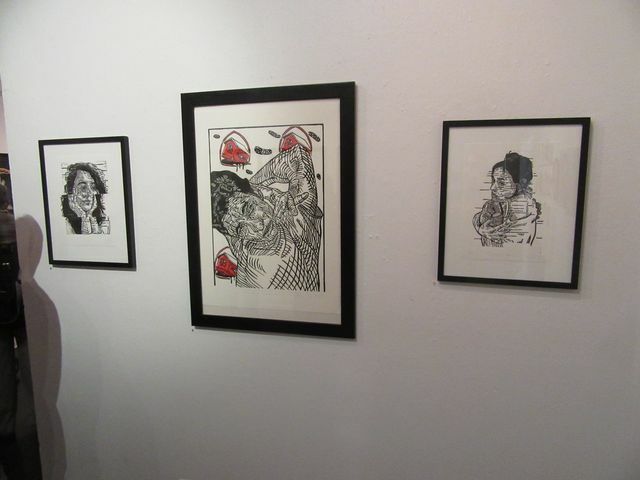 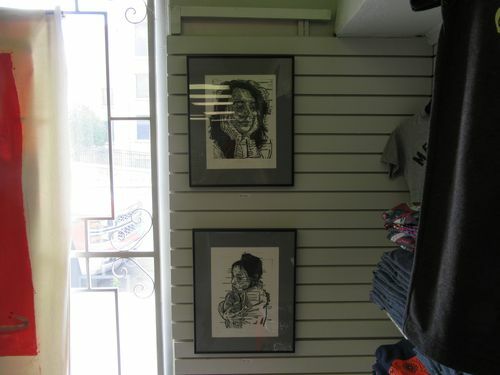 Tanya Rich showed her print at the Art Undressed exhibition at The Drawing Studio in Tucson. 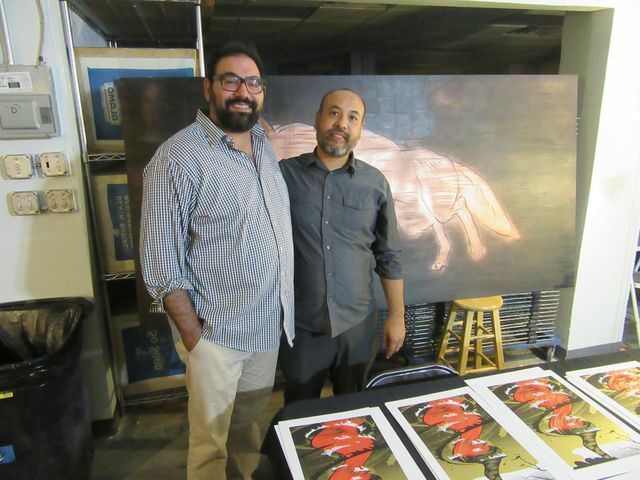 Francisco Delgado and Jesus "Cimi" Alvarado supported Gaspar Enriquez with paintings for a auction to support scholarships. This is just what I know about, since I am certain that other Desert Triangle artists are making an impact in other exhibitions this month. 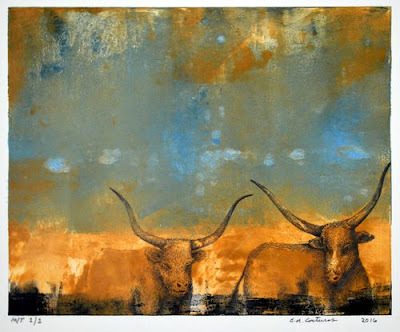 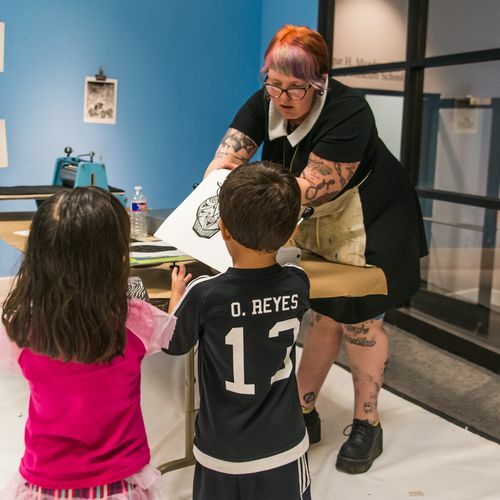 And Cynthia Evans did another print demo at the El Paso Museum of Art's Spark Saturday. 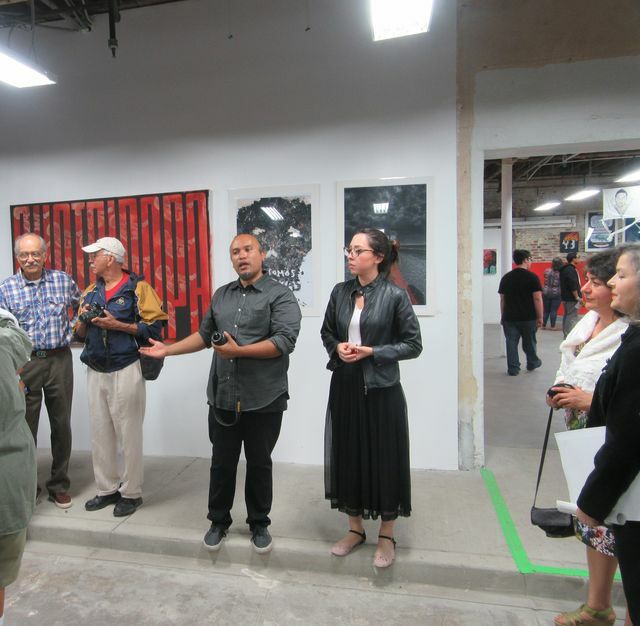 I also met the artists Ricardo Estrada, Rosalie Lopez and Jane Madson McCabe at the opening. 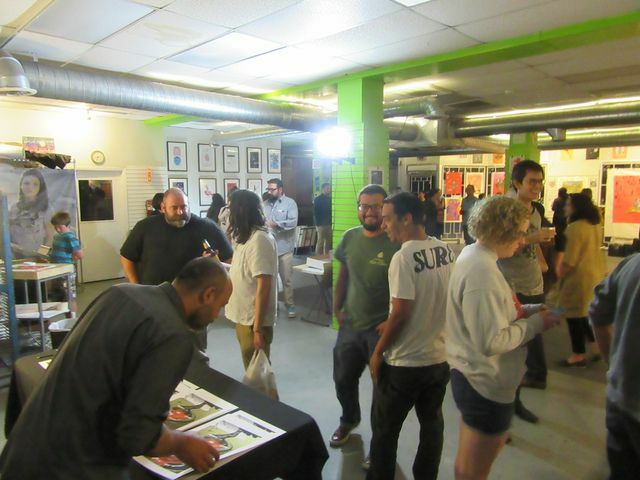 The Self-Help opening corresponded with the 2nd Thursdays Artwalk in downtown LA. 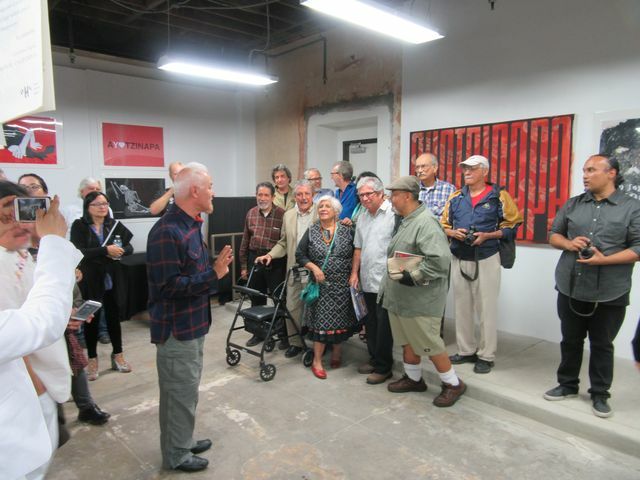 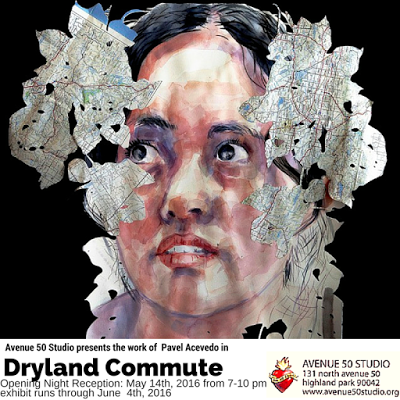 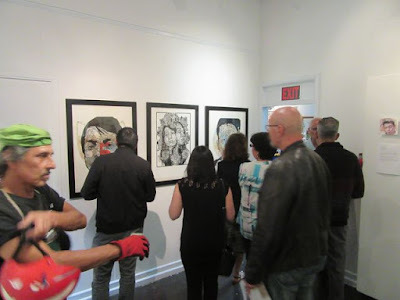 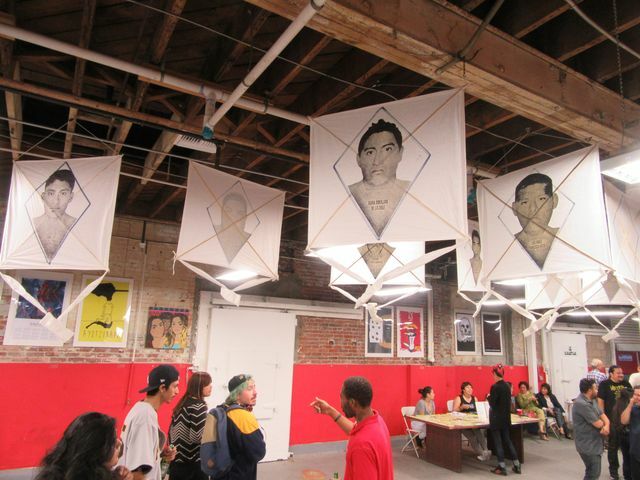 Pavel Acevedo also filled one of the rooms of Avenue 50 Studio, for their exhibition, opening on the night of May 14th. 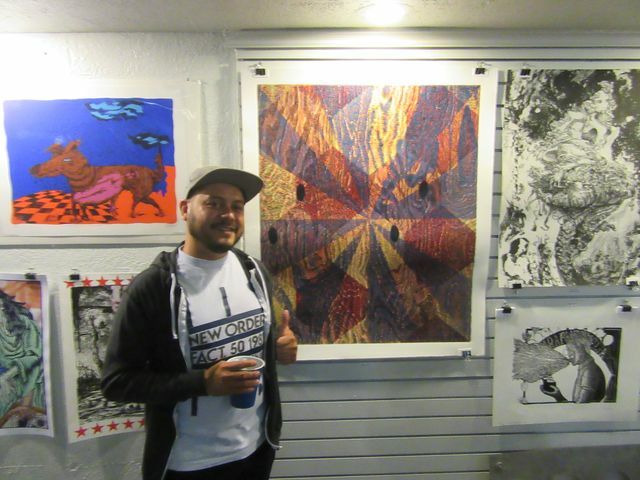 I also met the printmaker Matt Thomason at the opening. 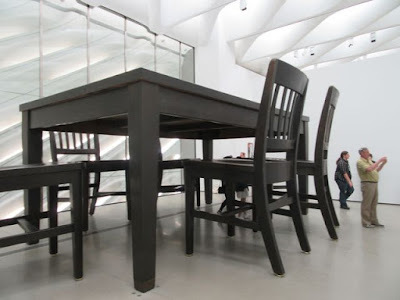 I also checked out the new Broad museum of contemporary art while in downtown LA. 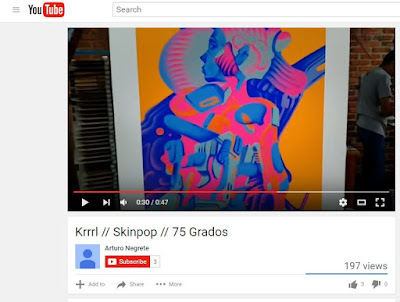 Krrrl commissioned Skinpop of Mexico City, to interpret one of his drawings. 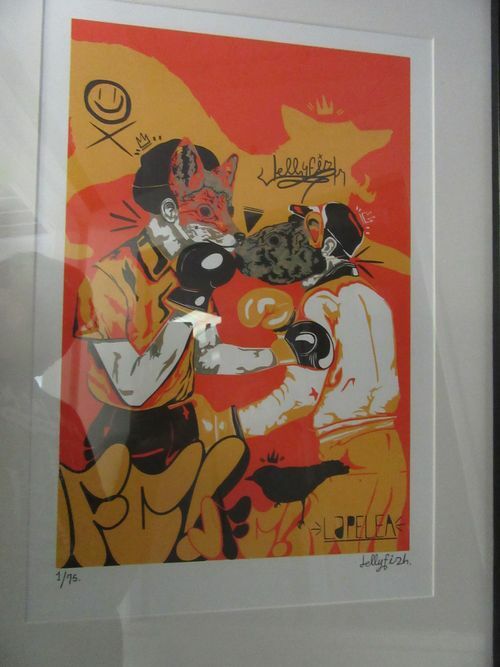 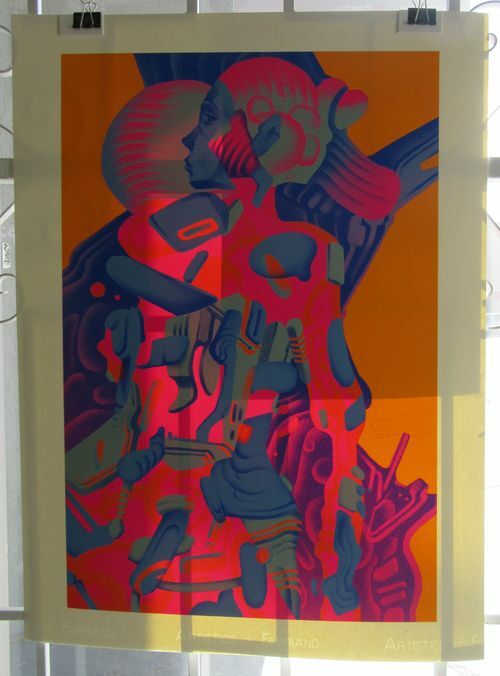 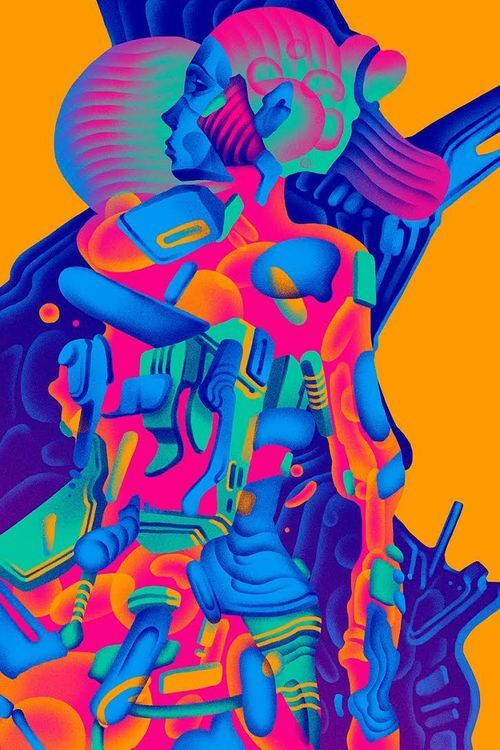 This was then recently made into a serigraph at Taller 75 Grados of Mexico City. 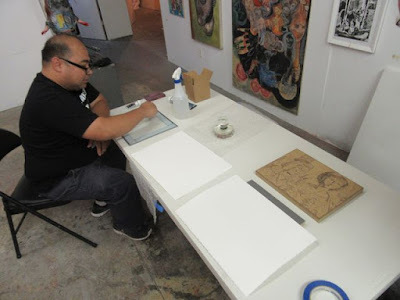 Zeke Peña participated in the House on Mango Street exhibition at the Hispanic National Cultural Center in Albuquerque, opening on April 29th. 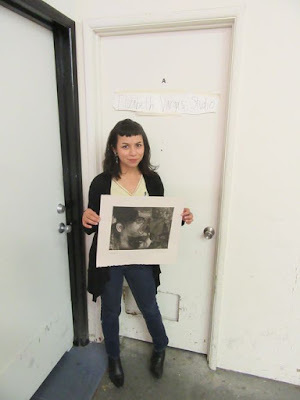 Tanya Rich submitted her print to the "Art Undressed" exhibition at The Drawing Studio in Tucson, running April 16th - May 7th. Mano Sotelo did a beautiful portrait of Tanya Rich. 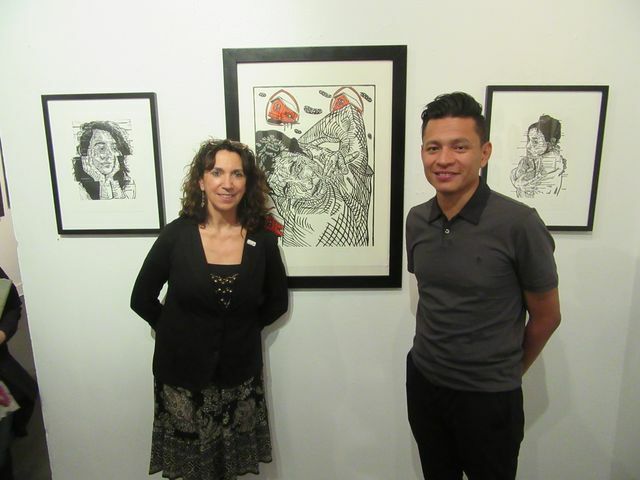 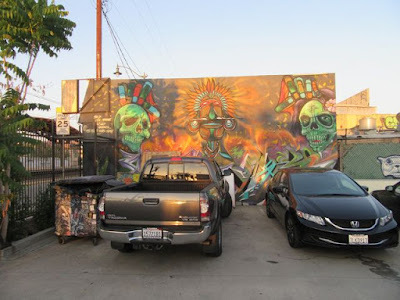 Francisco Delgado and Jesus "Cimi" Alvarado were once students of artist Gaspar Enriquez -- the Segundo Barrio Person of the Year 2016. 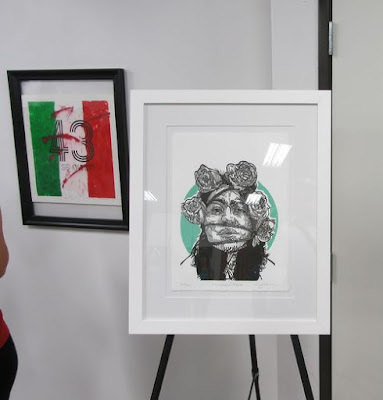 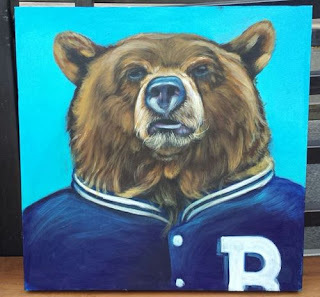 They were 2 of 6 ex-students, who were asked to do a painting for auction, to raise money for a Gaspar Enriquez scholarship. 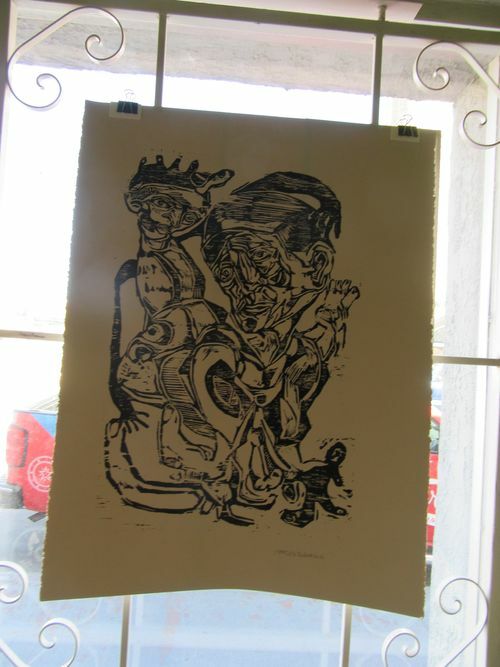 Francisco Degaldo is also in the Grafica Transfronteriza carpeta, showing in Oaxaca during June. 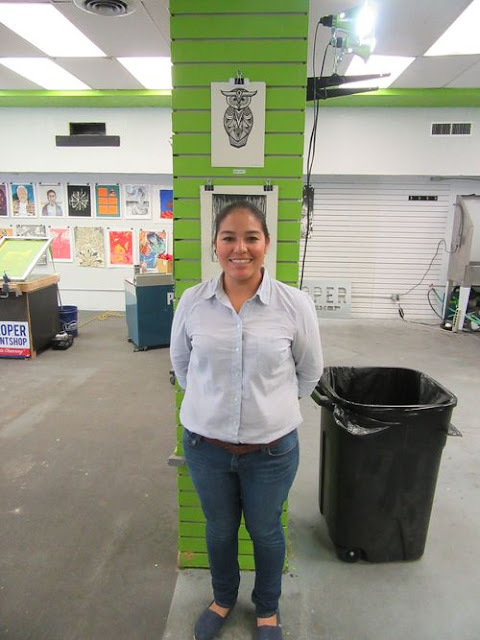 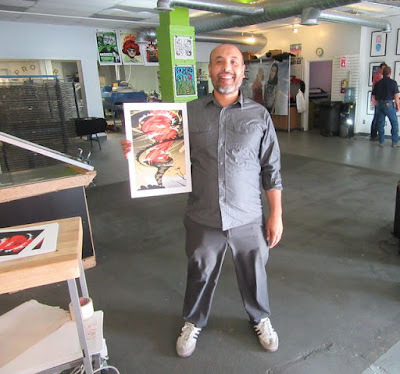 Gonzalo Espinosa finished a big tile ceramics project,for El Centro de la Raza in Seattle. 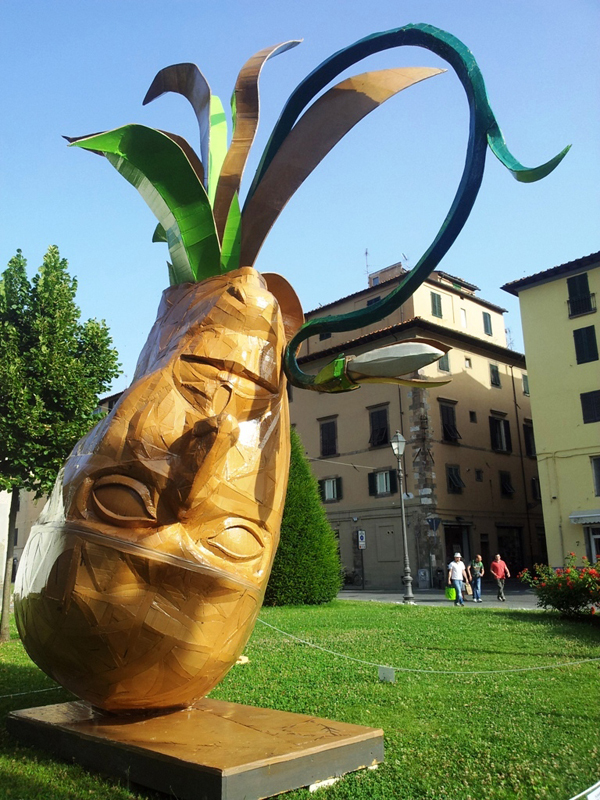 Mykl Wells is gearing up to go back to Cartasia, Italy, this summer to do another big cardboard art sculpture, like he did last year. 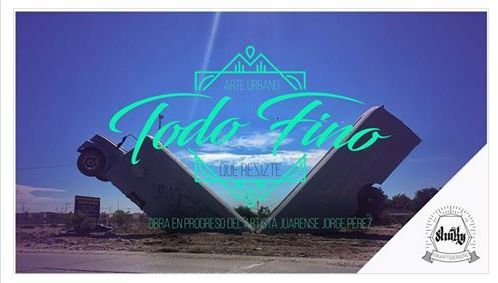 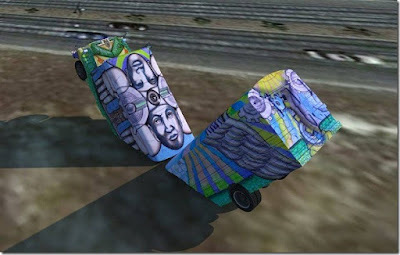 Yorch (Jorge Perez) finished his bus sculpture in Juarez, with buses buried into the ground. 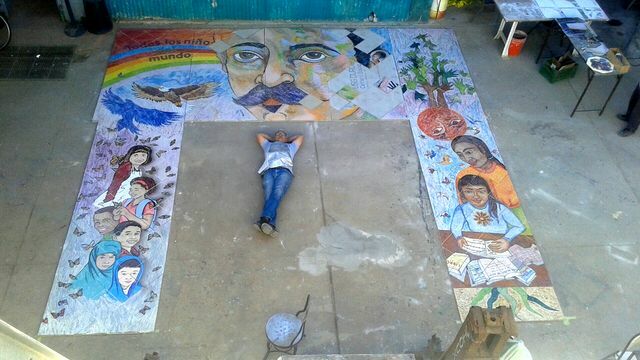 But still needs funds to finish up. 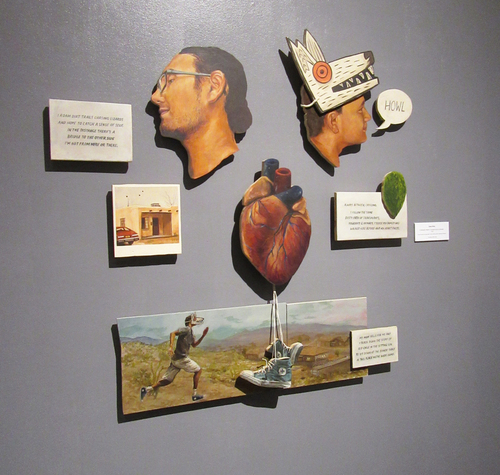 Rudy Flores 3D scanned and 3D printed several Tucson characters -- the Army Man Project -- as an art project, which was covered by Arizona Public Media of NPR. 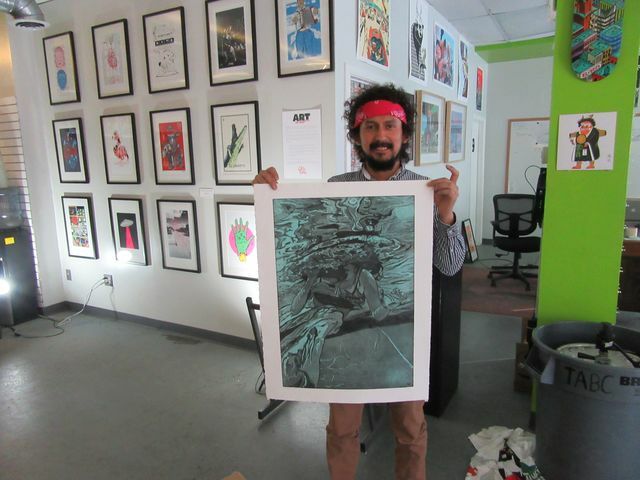 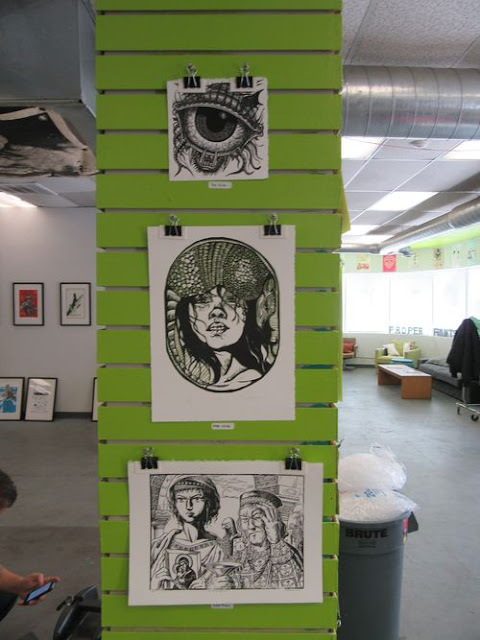 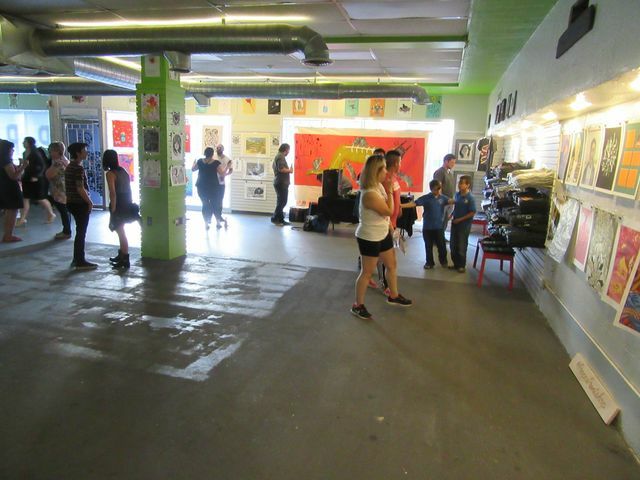 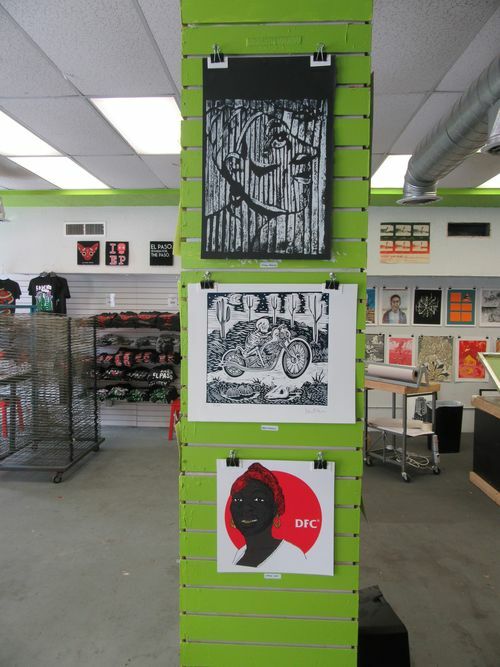 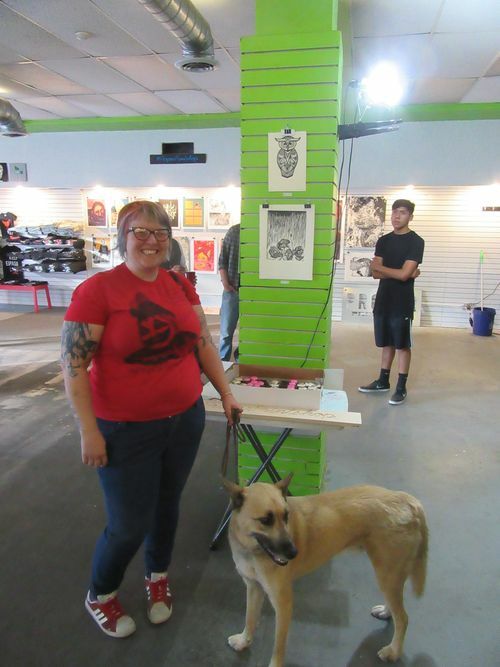 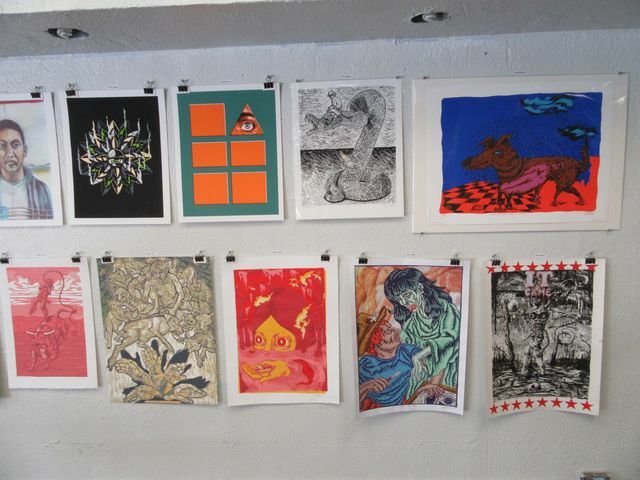 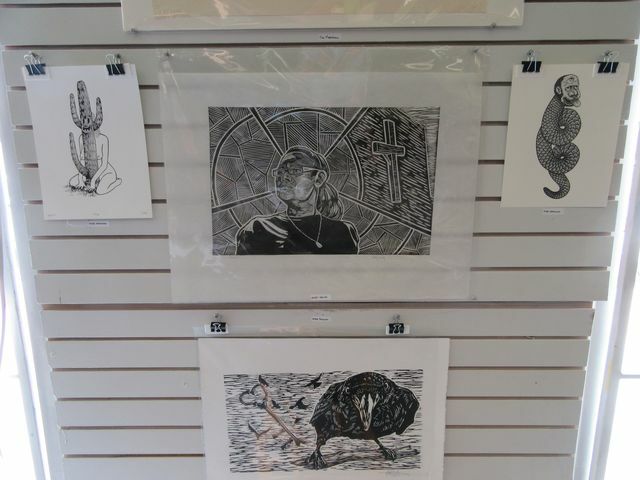 Also many of the Desert Triangle artists participated in the YayBig Print Exchange. 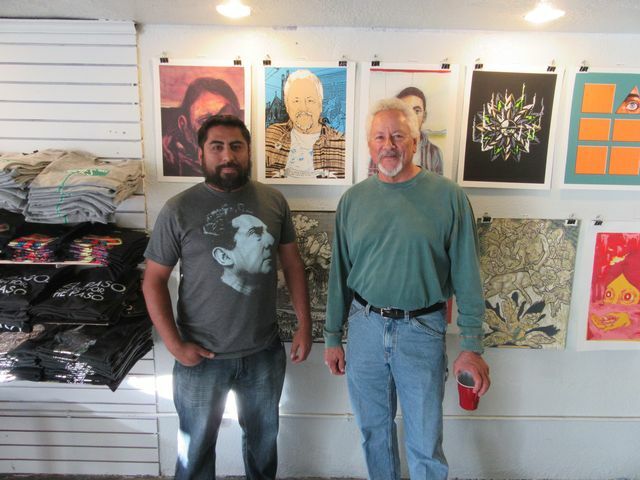 That print exchange is now showing near Yuma, Arizona.